A cracked and slightly worn and corroded silver Denarius of Hadrian. Measures 19.1mm diameter by 2mm thick and weighs 3.13g. Obverse description: Laureate head right. Reverse description: Figure seated left, holding branch/victory. A slightly worn silver Denarius of Hadrian. Rome mint. Measures 18.7mm diameter by 1.9mm thick and weighs 2.83g. A slightly worn, corroded, and incomplete silver Denarius of Hadrian. Measures 17.4mm diameter by 2.2mm thick and weighs 2.08g. 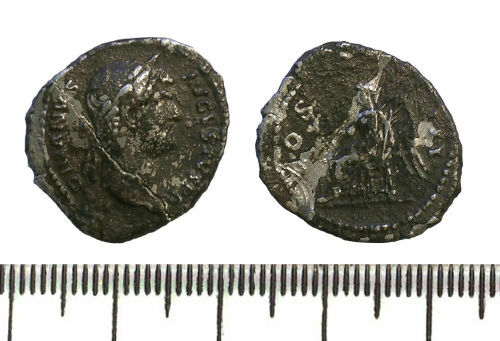 A slightly worn and corroded silver Denarius of Augustus. Measures 18.3mm diameter by 1.9mm thick and weighs 3.47g.